Monday, November 1, 2010 \AM\.\Mon\. Barack Obama entered office; nationalized health care; ran up record $1 trillion deficits; promised to hike taxes on the rich; pushed cap and trade through the House; took over large chunks of banks, insurance companies, and auto corporations; made hard-left appointments from Van Jones to Sonia Sotomayor — and in 21 months saw his positives crash from near 70% in January 2009 to little above 40%, with the specter of near record Democratic losses in the Congress just two years after the anti-Bush/anti-Iraq sweep of 2008. All the polls of independents and moderates show radical shifts and express unhappiness with higher taxes, larger deficits, a poor economy, and too much government. In other words, the electorate is not angry that Obama has moved too far to the right or stayed in the center or borrowed too little money. A Barney Frank or Dennis Kucinich is looking at an unusually tight race in a very liberal district not because liberals have had it with them, but because large numbers of moderates and independents most surely have. Yet if one were to read mainstream Democratic analysis, there is almost no acknowledgment that the party has become far too liberal. Indeed, they fault Obama for not being liberal enough, or, in the case of the Paul Krugman school, for not borrowing another trillion dollars for even more stimulus, despite the failure of the earlier borrowing. In fact, Obamaites offer three unhinged exegeses for the looming defeat: a) there is no looming defeat: the Democrats will still keep the House; or b) Obama did not prove to be the radical as promised; or c) the American people are clueless and can’t follow science and logic and therefore do not know what is good for them. Harry Reid Is Attempting A Coup Against Joe Biden! Wednesday, September 22, 2010 \AM\.\Wed\. As faithful readers of this blog know, I am Joe Biden’s number one fan. Not for his meaningless job as Veep, which does suit Joe like a velvet nose warmer as long as Obama, please God!, remains in good health. I am of course referring to his real job: beloved National Clown. In these dark days of the Obamacession, he has lightened the national mood with his verbal pratfalls, non-sequiturs, theater of the absurd behavior, inability to think first and talk later and, in general, his heroic willingness to be a fool 24/7 to put a smile on our faces as we stare into the economic abyss. A tear almost comes to my eye when I think of Joe’s unflappable dedication to a comic idiocy which no doubt is being loudly applauded by the Three Stooges and the Marx Brothers in that land which knows only laughter. We love ya Joe! Sunday, June 27, 2010 \AM\.\Sun\. Tuesday, March 23, 2010 \PM\.\Tue\. (Content advisory: Very bad language in the video above.) We can always depend upon our veep and national clown to add the sense of proper decorum to every official proceeding. So it was today with the signing of ObamaCare. Joe even helped the economy with his verbal wit, inspiring a t-shirt. Way to go Joe! Wednesday, February 17, 2010 \PM\.\Wed\. 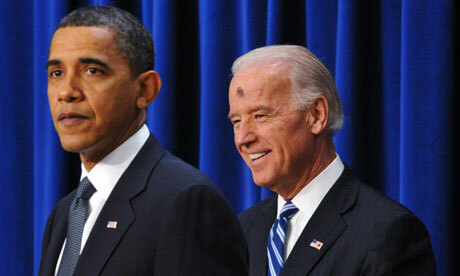 It’s Ash Wednesday and comic relief has arrived with our illustrious Vice-President Joe Biden! Biretta tip to Thomas Peters of the American Papist. Update I: Curiously funny video clip of U.K. Sky News host and self-identified Catholic Kay Burley mistakenly thinks the ashes on Biden’s is a bruise. 0:29 minute mark of the video clip – Kay Burley makes above remark. 3:06 minute mark of the video clip – Kay Burley’s mea culpa. Biden: Don’t You Want To Follow In My Footsteps Son? Tuesday, January 26, 2010 \AM\.\Tue\. Now, one year later, he is dismayed by what has happened to the Senate, and he is trying to convince a reluctant son to run for his former seat. We Still Love Ya Joe! Sunday, January 10, 2010 \AM\.\Sun\. Well what do you know? Who knew that this Saturday Night Live skit during the campaign accurately reflected Obama’s fears? Apparently Obama was greatly alarmed during the Fall in 08 at his running mate’s unending propensity to open his mouth and say something stupid. [W]hen Biden, at an October fund-raiser in Seattle, famously predicted that Obama would be tested with an international crisis, the then-Illinois senator had had enough. Speaking to his own staff, Biden insisted that it hadn’t really been a gaffe. And feeling a bit defensive, he invoked one of the worst memories of Obama’s primary campaign.